DYLANINTHECITY: Anna Dello Russo for H&M! Anyone who has paid any attention to anything fashion this week probably knows, well let's hope you do, that H&M has just announced an incredible and bold new collaboration with Fashion Director, Icon, and visionary, Anna Dello Russo. Dello Russo is the Fashion Director of Vogue Japan. She is an eccentric, self-proclaimed fashion maniac, who has consistently been an enigmatic, driving force behind the industry. Her style is iconic because of her adoration of lavish, elaborate pieces. She is the epitome of excess, and she happens to do it with absolute taste. Fashion to Dello Russo is, in her own words, her language; her alphabet. She is more than an Icon and a Director, she is an artist. Dello Russo's new line for H&M is planned to be, in the true essence of her style, a collection of over-the-top, super-luxury accessories. 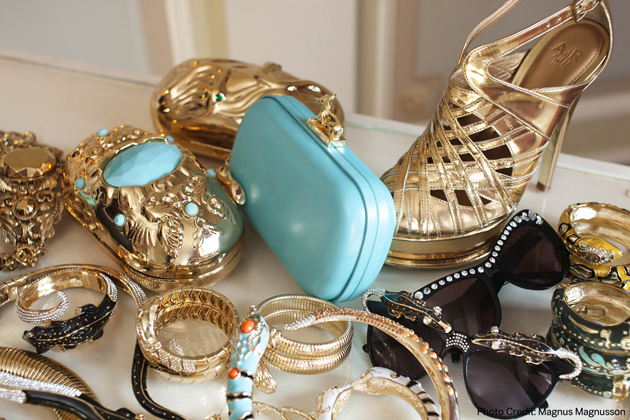 Gold and turquoise are rumoured to ground the collection in everything from bracelets, to necklaces, to shoes, to bags, and even sunglasses; chunky, oversized heels, gauche jewelry, and gold, gold, gold! I am officially obsessed and it hasn't even been released yet! The anticipation is enough. The collection has a planned release date of October 4th, 2012; smack dab in the middle of Fashion Weeks taking place all over the world. In the words of Margareta van den Bosch herself, Creative Advisor of H&M, Anna Dello Russo for H&M is meant to be a "celebration of excess, fantasy, and decoration". Make sure you're in line this Autumn, otherwise I'll be taking your place!